Please visit our Newsletter section for the latest edition of the Bed and Breakfast Traveller. In the twenty-third issue of the Bed and Breakfast Traveller, we take you to Beaver Valley -The Heart of Your Vacation Experience. Beaver Valley is a largely undiscovered jewel that lies in the heart of Ontario's Lake Lands. Nestled in a triangle of unsurpassed beauty is a valley which features a pristine lake, Lake Eugenia, waterfalls, the Beaver River, and the Bruce Trail of the famed Niagara Escarpment. The mountains of the Beaver Valley offer excellent skiing in winter and breathtaking beauty in summer and fall. But this is not just a place of relaxation and renewal; it is also a place of action and excitement. 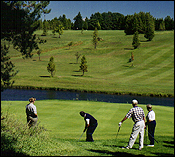 Beaver Valley offers a wealth of activities. Enjoy fishing, swimming, and boating at Lake Eugenia or canoe or fish on the Beaver River. For more excitement try windsurfing, water-skiing, or tubing on the river. Or visit one of 10 golf courses in the area within a 30 minute drive. Golf prices are an excellent value. Try rock climbing, hiking the Bruce Trail, or cycling on the Georgian Trail or on one of the scenic back roads. Horseback riding, rodeos, and gaming shows offer excitement to animal lovers of all ages. A multitude of exciting events will keep your family busy. Visit the Meaford Lions Car Show, July 13th., or dance and dine at the Kimberley Summerfest July 20th. Experience the Elvis Festival in Collingwood, July 26th. to 29th. or bring the family to the many events at the Markdale Ice Cream Festival Aug. 2nd. to 4th. (www.village.markdale.on.ca) Enjoy one of the many fairs or farmers markets in Flesherton or Keady. If you enjoy arts, culture, and music there are a huge selection of events to choose from. Little theatres in Collingwood, Meaford, and Dundalk offer excellent plays at bargain prices. Jazz concerts, music in the park, and Opera in the Barn are just a few of your many choices all summer long. Art shows, art lessons, and antique shows round out your cultural experience. Visit one of the many local museums and take a walk into the past. For those who love to shop there are the farmer's markets and the famous Keady Tues. market. Visit the delightful gift and antique shops in Markdale, Eugenia, Meaford, Thornbury, and Collingwood to buy that special treasure. Each of these towns is only minutes away from your Bed & Breakfast in the Beaver Valley. And of course no holiday is complete without a visit to one of the fine restaurants in the area. We invite you to stay at one of our many Bed & Breakfasts in Beaver Valley. Your hosts will treat you like family or give you complete privacy. Enjoy a holiday at beautiful Lake Eugenia, on a peaceful farm, in a quaint village, or in a scenic escarpment setting. Whatever your desires, you will find them in Beaver Valley, the heart of your vacation experience. Interested in having your region featured in the next Traveller? Click here for details.